Coronary artery bypass grafting, commonly called coronary bypass surgery, restores blood flow to the heart by providing blood an alternate route around a blocked artery. Surgeons create this alternate pathway by taking a section of a healthy blood vessel and connecting it to unblocked arteries of the heart forming a bridge over or around the blockage. This process is called grafting. 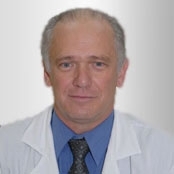 Who should pursue Coronary Artery Bypass Grafting? If you suffer from chest pain and shortness of breath, then you should definitely seek medical attention as these are common symptoms of heart disease. Symptoms caused by a blocked artery can often be relieved via coronary bypass surgery. Nevertheless, only discussing your medical condition with your doctor will confirm if this surgery is right for you. Additionally, if you have a heart attack, coronary artery bypass grafting may be performed as an emergency treatment. Keep in mind that heart disease, such as atherosclerosis or coronary artery disease, is the cause of your artery blockage. Therefore, coronary artery bypass grafting merely compensates for the blockage. It does not cure heart disease. Your doctor will notify of you specific changes or restrictions you should make in your diet and activities as your prepare for the day of your procedure. He or she will also conduct x-rays, blood tests, an electrocardiogram, and a coronary angiogram to gain a full grasp of your cardiovascular condition. An electrocardiogram tests your heart function while a coronary angiogram tests how well your coronary arteries feed your heart. Coronary bypass surgery is a form of open-heart surgery, so there are complications that your doctor will explain to you. Bleeding and development of an abnormal heartbeat are the most common complications. However, infection, kidney failure, stroke, heart attack, and temporary memory loss are other potential risk factors. Expect your doctor to comb through your entire medical history to determine which of these risks may actually apply to you. If you have blocked arteries in your legs known as peripheral artery disease (PAD), diabetes, emphysema, or kidney disease, then your risk for these complications will be greater. Your risk also increases if your coronary bypass surgery is performed as an emergency operation. How is Coronary Artery Bypass Grafting performed? At the time of your procedure, your anesthesiologist will sedate you with general anesthesia for this three to six hour surgery. The location and number of blockages within your coronary arteries determine the actual length of your surgery. During and immediately after your surgery, a breathing tube connected to a ventilator will be in your mouth and throat to breathe for you as you sleep. First, your surgeon will make an incision down the center of your chest and spread your rib cage open to expose your heart. Then, your heart will be stopped temporarily and a heart-lung machine will take over circulating your blood. Next, your surgeon will obtain a graft by extracting a section of healthy blood vessel from inside your chest wall or from your leg. He or she will then attach the ends of the graft above and below the blockage. This process is repeated as necessary until an alternate pathway around each blockage is available to your blood. In rare cases, patients have off-pump or beating-heart coronary bypass surgeries. These surgeries use special equipment to stabilize the region of the heart that the surgeon is operating on while the rest of the heart continues to beat. 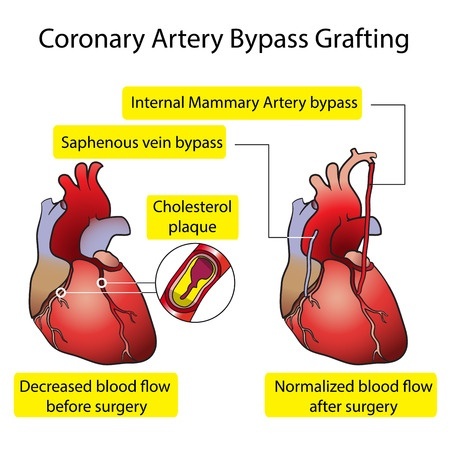 Depending on your blockage, coronary artery bypass grafting can be performed as a minimally invasive surgery. This surgery requires a much smaller incision along with the assistance of video imaging and robotics. Post-operation, speaking will be difficult and likely impossible after you awake from the anesthesia and your breathing tube is removed. Afterwards, patients remain in the hospital anywhere from one day to a week. During this time, your surgical team will monitor your heart, blood pressure, breathing, and other vital signs closely. After you return home, it will take significant time for you to perform everyday tasks like before your operation. You will also be advised to pay attention to your health and immediately call your doctor if you experience reddening or bleeding around your chest incision, worsened chest pain, rapid heart rate, or a fever higher than 100.4°F. Allow four to six weeks for recovery prior to driving, completing daily chores, or returning to work. In the months following your bypass, you should see your doctor and cardiologist regularly for scheduled appointments. These follow-up appointments are necessary to check your heart function, overall health, and investigate any symptoms you may be experiencing. In an effort to treat your heart disease, your doctor may prescribe you one or more medications to lower your blood cholesterol, reduce your risk of developing blood clots, and boost your heart function. Nevertheless, instead of fully relying on these drugs, you should take control of your heart health by quitting smoking, exercising regularly, maintaining a healthy weight, controlling stress and anger, and participating in a cardiac rehabilitation program.